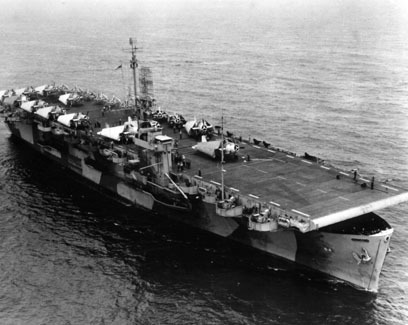 Named for the port city of Tripoli successfully invaded by the US in 1805, USS Tripoli was commissioned on Oct. 31, 1943. After an accidental fire and subsequent repairs, the ship was sent to the Atlantic Fleet. She began patrolling near the Cape Verde Islands to disrupt German submarine operations. The ship had encounters with U-boats for the next few months. In June 1944, the ship was used for carrier qualification training. At the beginning of August, the ship was sent to Brazil to operate against German marine targets in the southern Atlantic. They participated in several hunt and kill missions to find and destroy U-boats. At the end of 1945, Tripoli reported to the Pacific for transport and training operations. She made a ferrying trip to Roi, in the Marshall Islands, with fighters and bombers aboard. Her training operations continued off of the Hawaiian Islands until the fall of 1945. She was then sent to help transport US troops home in operation “Magic Carpet”. She was decommissioned in May 1946. But, she reentered service in January 1952 due to the Korean War. She conducted dozens of transport voyages over the next few years. She was formally decommissioned for the second time in 1959.